Disclosure: I received the Magic Castle Bouncer for review at a significant discount from Blast Zone. All opinions are my own. Kenzie sure does love bounce houses and when she saw the Blast Zone Magic Castle Bouncer ($269.99 + free shipping), her excitement couldn't be contained. It is the perfect bouncer for personal use because it is a breeze to set up with endless fun to be had. You lay out the castle bouncer and attach the UL listed blower (included). Plug into an outlet and let it inflate and it's ready to bounce on in less than 2 minutes! *Make sure to tie the tube next to the blower attachment tube as well, otherwise the bounce house will not inflate. This is the same tube you will untie to deflate the unit. Use the included stakes to steady the bouncer into the grass or use bounce house sandbags (I had Hubs purchase these so we can use the bouncer in our driveway). You can pick up a 50lb bag of sand at Home Depot for less than $5! The Magic Castle Bouncer from Blast Zone is loads of fun - check out my video review! 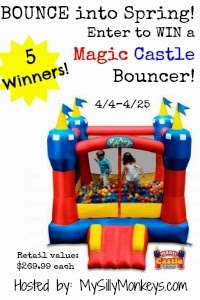 5 Winners will Receive a Magic Castle Bouncer! I would love to win for my 2 girls. They would have so much fun! I would like to win for my daughters and my nieces and nephews. Since we don't live very close to a park, this would be fantastic to keep them entertained. I would love to get my kids the Magic Castle Commercial 8 Bouncer Moonwalk. I would love to win and donate it to my sons school! They have lots of family fun nights and this would be a great addition! I would love to win this for my 4 little ones and their friends. Every time we go to a bounce place, my kids come out sick. This would be great for the summer. I would want to win this for my daughter. She would have so much fun with her friends this summer. It would save me money from renting a bounce house for her birthday party. i would love to win this for my grandchildren, I have 4 now under 5 and 2 more due this year, this would be great to entertain them at my house. all the neighborhood kids hang out at my house, so this would be awesome to have! crocodile isle water park is A-MAZING! I would give it to my son. He loves to jump and I would love to get some of his energy out. I would love to get it for my baby girls1st bday as she loves to jump with other cousins. This bounce house looks wonderful! It'd be amazing to give this to my little sister as she has way too much energy, maybe this could finally tucker her out! Ooooh! The misty kingdom looks perfect for my little sister and cousins to play the day away! My kids and all their friends and cousins would LOVE this! I want to win this for my grandson. This would be great for when they come for our weekly family dinner! My kids love bouncy houses! I would love to win this for my little guy to give him some exercise and outdoor time. I would also love to have the Rock Crawler Inflatable Bouncer and Ball Pit. I would win for my little man. My kids and niece would LOVE this!! So would us adults!! This would be amazing for my daughter Fiona Rose! My kid would love that! Oh this would give my kids an outlet for all of their energy, I have a 3.5 and a 5.5 year old! This is such an awesome giveaway!I would love to win this for my six kids. I would love to have the Tropical Splash Water Slide for my children! This would make the backyard the place to be this Summer! I would love to win this for my son because he loves to bounce in these things. This would be great to have for my cookouts this summer. My daughter and nieces and nephews would have a blast and it would keep them busy while we cook!! I would also like to have the Rainforest Rapids Bounce House and a Water Park. This would be great for my grandchildren when they visit. We have the room in our back yard for this and our daughters would love to bounce on this every day! For my kids they would love this. I want to win this a) for my own kids. . . they would have a blast and b) because my neighbors have huge parties for pretty much every holiday. I always volunteer to babysit anyone's kids who is staying into the evening. I have my 2 bffs come over to help out and we have our own party! Playing ouside, a craft, a movie and pizza (all the kids bring $2 to help with pizza), and then a 'camp in' in the living room. This bounce house would make it SOOO much more fun! 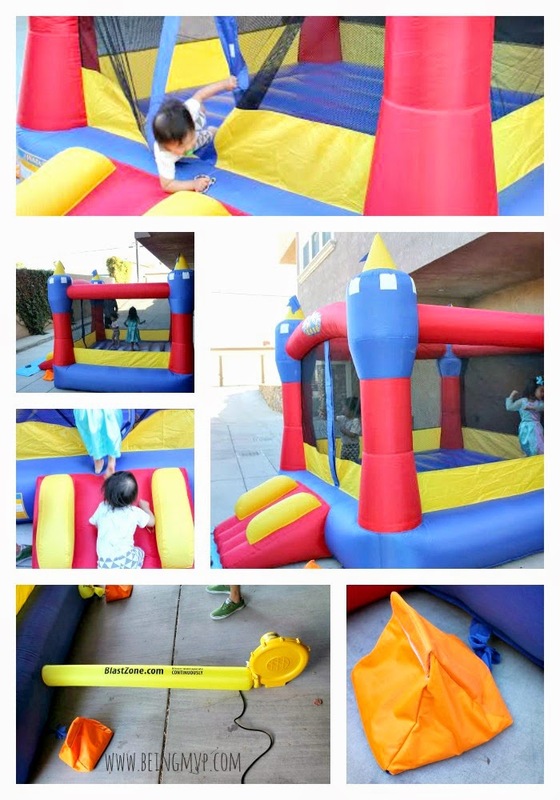 The Splash N Spray bouncer looks like a blast for the kids! I like the spray n splash and the buccaneer water park. I'd love to win this because I've rented one before and would love to own one, My grandsons would love playing in this! I want to win this for my son and nieces and nephew to have at my parents house. They would have a blast with one of these. I want to win this for my niece! lol, she actually asked me for one at her birthday! WOW! this bouncer would be for the 30+ kids under the age of 10 in my neighborhood! My little guy would love it but he would enjoy it even better wuth all of his buddies! Who whouldn't love a bounce house in their yard!!! the ainforest Rapids Bounce House and a Water Park.looks AMAZING!!!!!!!!!!! I would love to win this to put in my back yard. My grandkids would love it. and who the bouncer would be for if you won. I'd keep it at my house so that the grands would come to my house more often!!! I would love to win this for my two daughters. They are always trying to jump off of everything and this would be great for them. The pirates bay water park would look great in my yard. I'd love to have the Ball Kingdom Bounce House and Ball Pit. I would love to win this for my 4 year old so that she has something to play with out back! My son loves playing in bouncy houses! This will be for my son and his little brother ,when bigger enough, and my nephew. I also love the The Pirates Bay Inflatable Play Park. The Pirate Blaster...my boys would have a great time in that!! I would love to win this for my boys. They would love this and it would definitely keep them active. I think my boys would really enjoy the Pirates Bay play park. I would love to win this for my 5 year old daughter. I have a trampoline for my older daughter, but I feel like this would be more fun for the little one as well as safer! The princess combo with slide looks awesome! My daughter is definitely a little princess and would love the pink and purple!